Sacroiliac symptoms rarely help to positively identify the SI joint as the actual cause of pain. Instead, symptoms often mimic lower back and/or hip pain syndromes. Worse still, symptoms of sacroiliac joint conditions can be very diverse, often incorporating radiating pain in the lumbar spine, buttocks, legs, pelvis and groin. It is virtually impossible to characterize a “typical” case of sacroiliac joint pain. Most SI joint symptoms are mild to moderate and can be controlled or even completely cured using conservative methods of care. Some pain syndromes can become severe and even debilitating, often leading to quick escalation in care to include more dramatic pharmaceutical products, injection therapies and surgical interventions. However, it is statistically rare that sacroiliac joint pain syndromes will be responsible for lasting disability. This resource section details the various symptomatic expressions most often seen in association with various SI joint diagnoses. This section is important research material for anyone who has been diagnosed with a sacroiliac joint conditions, hip conditions, lumbar spinal conditions or piriformis muscle conditions, yet has not received adequate relief from treatment. Pain is usually present upon weight bearing on the affected side. This pain might be worsened when climbing or descending stairs, since force on the joint is focused during these physical exertions. Pain is usually worse when transitioning from a seated posture to a standing posture and vice versa. Likewise, moving from a standing posture to a kneeling or crawling position can be equally painful, as can the opposite action of standing from these postures. Some patients experience pain when lying in a fetal position with the affected joint down into the bed. Firm beds can exacerbate this occurrence, while soft beds can help relieve it to a small degree, according to most patient citations. Sacroiliac sciatica can occur, with symptoms often radiating into the buttocks or upper leg. A minority of patients experience pain below the knee and even into the foot on the affected side. 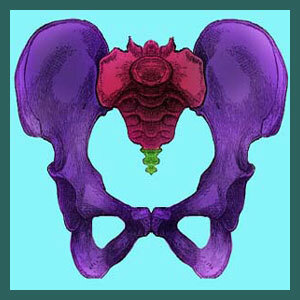 Some patients suffer pelvic pain, groin pain or hip pain in the front or rear of the hip joint. Sacroiliac buttocks pain is often mistakenly diagnosed as spinally-motivated sciatica or piriformis syndrome. Sacroiliac leg pain is a form of pseudo-sciatica that usually exists unilaterally in the upper rear or outer side of the leg. Sacroiliac leg weakness is a typical accompanying expression of some forms of sacroiliac-motivated pseudo-sciatica. Sacroiliac hip pain syndromes are often blamed on structural degeneration in the hip joint itself, since anatomical changes are likely to be visualized during diagnostic imaging and can act as convincing scapegoats. We have seen several examples of the sacroiliac joint causing knee pain. In this new dialog, we explore how the SI joint can be implicated in knee pathologies. Our proven pain relief program can help you immediately. The program can manage or cure sacroiliac symptoms without drugs or surgery. So many dorsalgia diagnoses produce strikingly similar symptomatic patterns. Combine this fact with the common incidence of sacroiliac conditions existing as revisionary diagnoses and an observer can easily understand why so many people are mistakenly diagnosed. In essence, many people diagnosed with SIJ disorders are actually suffering from alternative causative mechanisms. Additionally, some people who are diagnosed with lumbar, hip, piriformis and pelvic pain conditions are truly suffering from SI joint concerns. Patients are therefore strongly advised to seek multiple diagnostic opinions from different types of care providers. Remember that there are very few cases of sacroiliac symptoms that are objectively diagnosed. Instead, most are subjectively diagnosed and might not feature accurate conclusions. When treatment for any of the above conditions (including SIJ disorders) fails, it is usually due to mistaken identification of the true reason for pain and subsequent incorrect targeting of treatment.